up close and personal, as well as the terrain. 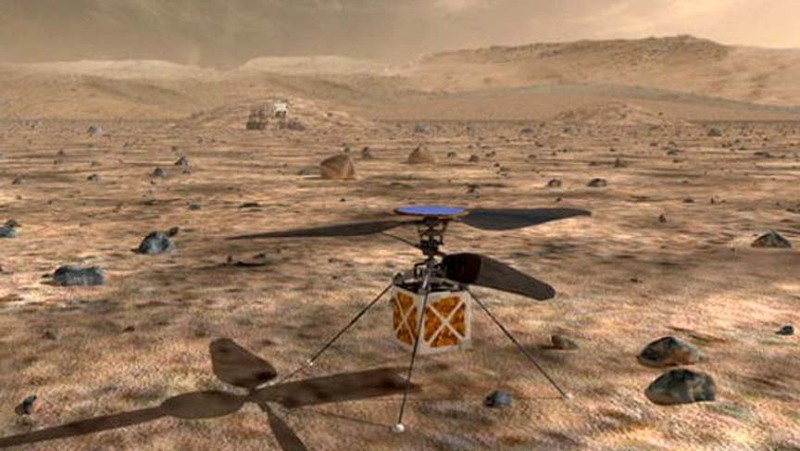 So next year on the mission to Mars, NASA is sending a helicopter. Considering the Martian atmosphere, the Mars Helicopter design team faces a number of daunting challenges. At the surface where the Mars 2020 rover is targeted to land, the atmospheric pressure is equivalent to about 100,000 feet above the Earth’s surface, NASA said. No helicopter has ever reached even half that distance above Earth. So the NASA engineers at the Jet Propulsion Laboratory are designing a Mars Helicopter that will be able to fly as high as about 15 feet above the Red Planet thanks to its two sets of rotor blades – each four feet long, tip-to-tip – spinning at 2,400 rotations per minute, which is about 10 times faster than an Earth helicopter. The Chinook spins at 103 rpm maximum. The main helicopter body will also be really small — about the size of a softball and will weigh just under four pounds. According to NASA, the plan at Mars is to attempt up to five flights, each one flying just a little farther and each lasting up to 90 seconds. A solar array on the top of the vehicle will recharge the batteries, which will be used both to rotate the blades and to keep the vehicle warm, especially at night. I wonder how far it can fly in 45 seconds, but I guess this is mostly proving it can be done. The helicopter will also be carrying a camera — nearly identical in capability to the average smart phone — to capture images of the Martian surface it flies over for transmission back to Earth. If the Mars Helicopter works as planned, JPL scientists say future missions to the Red Planet could carry and deploy even more helicopters to extend the scientific reach of the landers they arrived on, by exploring the skies above Mars. I wonder if they'll bring it home or abandon it on Mars? They'll probably throw a tennis ball and when Choppa chases it, they'll take off without him. Then when he returns with the ball will dutifully sit and stay. He'll whimper, sniffing the scent on the ball and remember his friends who abandoned him so far from home.